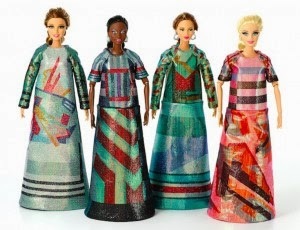 London-based textile designer Sadie Williams has created a new Barbie Style! collection. Each of the five Barbie Style! dolls is a special edition one-off priced at £120, available exclusively from the Barbie department in Selfridges London’s Toy Shop from February 14. Launching during London Fashion Week, each outfit features a mix-up of hand-collaged prints which reference vintage sports clothing, graphic Amish quilts, and abstract shapes. With an MA in Textiles For Fashion, Sadie specialises in using a heat press to bond fabrics in multi-layers, which gives these bespoke gowns their bold silhouette. Each Barbie Style! doll comes with a look book featuring 10 pages of styling tips and ideas, and is a available from the Barbie department at Selfridges, priced £17.99.